Where better to review than the inimitable Thai city of Bangkok. 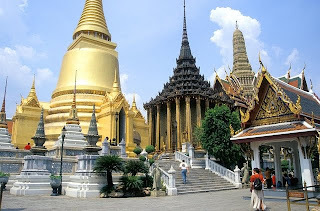 The capital of Thailand has many monikers, "the Big Mango, "City of Angels" or "Krung Thep" as it is known to the locals. "Krungthep Maha Nakorn Amorn Ratanakosindra Mahindrayudhya, Mahadilokpop Noparatana Rajthani Burirom Udom Rajnivet Mahastan Amorn Pimarn Avatarn Satit Sakkatuttiya Vishnukarm Prasit". Wow, what a tongue-twister, I think even most native Thai speakers would struggle with that!!! Better still, try saying it after a couple of Johnnie Walkers!!!! Bangkok is often described as a city of contrasts. This is reflected both in the cityscape, with the juxtaposition of centuries-old temples and gleaming 21st century skyscrapers and in society itself, with beggars sharing pavement space with the Gucci-wearing members of Thailand's high-society!!!! The city has a plethora of eye-catching cultural landmarks and together with its infamous adult nightlife, balmy climate and delicious food, means the city is synonymous with fun, exoticism and pleasure. But beneath this facade of enjoyment lurks a more dangerous, seedy and visceral Bangkok. With scammers around every corner, a changing politcal atmosphere, increasing numbers of undesirables arriving on a daily basis and the fall-out from the global economic crisis, I am of the opinion that travellers are more more likely to encounter problems than they were 5 or 6 years ago when I first visited Bangkok!!! The pace of life in Bangkok is frenetic, so if you're looking for a quiet, relaxing getaway then Bangers is certainly NOT the place for you.....But if you're looking for fun, adventure and excitement then you've hit the proverbial jackpot. When visiting the city for the first time, I always find it helps to have an idea of the places you would like to visit and then choose a hotel based on its proximity to the sites on your itinerary. I know this may sound stupid and I'm sure this is what most people do. But, because Bangkok is a large, sprawling city and the places of interest are spread out, it helps to be fairly close to where you want to go. Nevertheless, travelling around Bangkok is not difficult, even though public transport is not as good as you find in the West. However, the transport system has improved enormously over the years with the introduction of the Skytrain (BTS) and the underground (MRT). Taxis meters are readily available and offer very good value for money but journey's can take a long time due to the large volume of traffic. River taxis and express boats are cheap and convenient and there are many bus networks cris-crossing the city. Tuk Tuk's are also an option for short journey's but they rarely charge less than 100 baht and many will try to take you tailors or gem shops and I try to avoid them if at all possible. I have found that the best way to introduce a visitor to Bangkok is to show them main areas of interest and I believe that the 8 districts I have listed below, offer the best hotels, attractions, shopping, entertainment and dining. The riverside area of Bangkok is a haven for photographers and gives tourists the chance to exeperience some of Thailand's most famous monuments and attractions. 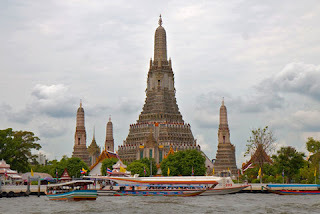 The Grand Palace, Wat Phra Keaw (Temple of the Emerald Buddha), Wat Arun (The Dawn Temple) and Wat Pho, are just a few of the delights that are located along the banks of the Chao Phraya river. The Chao Phraya or "River of Kings" is integral to daily-life in Bangok. Water taxis can be seen ferrying commuters to their places of work, long-tailed boats whizz along taking wide-eyed tourists on voyages of discovery and old fashioned rice barges chug slowly along to deliver their of exotic cargos. It is also a focal point in the city during important events like "Loy Kratong" and the New Year "Songkran" festival. Despite it's history and old-world charm it is home to many of the city's swankiest 5-star hotels such as the Peninsula, Sheraton, Hilton and Shangri-La. Sukhumvit Road, bisects the city from East to West and takes you from the centre of Bangkok out into suburbia and beyond the city limits. Each lane or "soi" adjacent to the main road, has its own unique personality and you can while away many an hour exploring them all. You will stumble across hidden treasures like the beautiful "Benjasiri Park", an oasis of calm in a chaotic city, which was created to celebrate Queen Sirikit's 60th birthday, or the delightful "Kamthieng House", a stilted rice farmer's dwelling, typical of the 19th century and built entirely of teak wood. Those with families will also enjoy the "Science Museum & Planetarium". Despite being rather light on the more traditional tourist attractions, visitors are drawn to Sukhumvit by the trendy shopping malls, boutiques and good quality restaurants. There are also plenty of accommodation options from 5 star to budget. But in my humble opinion, Sukhumvit's greatest asset is its fantastic nightlife. You can find upmarket nightclubs, European style bars & bistros together with the red-light districts of Nana Plaza (Soi 4), Soi Cowboy (between Soi 21 and Soi 23) and the "artists Bars" of Soi 33. 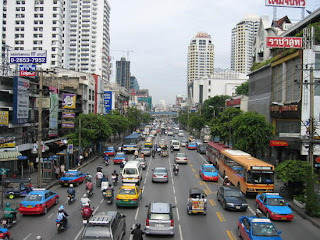 By day Silom Road is part of Bangkok's bustling commercial hub, with towering skyscrapers housing the city's key financial institutions and blue-chip companies. But, by night the area puts on its flares and dancing shoes and the infamous "Patpong" comes alive. It is a small area of 2 adjacent sois and best known for its night market and "adult themed entertainment". There are a broad range of hotels to suit all budgets and tastes in this area but cultural attractions are few and far between. However, a popular spot is Wat Khaek Silom better known as the Sri Mariamman Hindu Temple. Siam Square is, without a doubt, Bangkok's premier shopping district and home to the city's fashionistas and trend-setters. Here visitors will find the ever popular Siam Discovery Centre, the MBK Centre and the wallet-busting Siam Paragon. Within the Square, there are a wide range of restaurants, bars and cafes, together with cinemas, bowling alleys and the ubiquitous Hard Rock Cafe!!! The hotels in this area are definitely not for the budget conscious and feature top-end establishments like the Four Seasons and Vie Hotel. Tourists come to this area for one resason.......shopping!!! Whether you're searching for cut-price electrical items at Panthip Plaza or designer lables at discount prices in one of the many factory outlets, Pratunam is the place for you. It is one of Bangok's busiest and most colourful districts and is full of street markets, stalls and bazaars. There are also several worthwhile attractions here including the open-air, revolving viewing deck, on the 84th floor of the Baiyoke Sky Hotel and for those of you looking for a bit more tranquility, there is the "Suan Pakkard Palace", which features five antique Thai-style houses set in a beautiful landscaped garden. Pratunam is rather short on nightlife options but there are plenty of accommodation options. For more than twenty years, Khao San Road has been area of choice for budget travellers and backpackers looking to experience Thailand on a shoe-string. There are no major attractions in Khao San Road. However, being located in "Rattana Kosin" or the "old city" means there is plenty of traditional Thai architecture to admire and countless old sois to explore.In recent years Khao San has undergone a bit of a facelift and there are now some nice mid-range hotels and slightly more upmarket bars and restaurants. But it is still the centre of the universe for those on a tight budget, so there are plenty of cheap hotels and guest houses and good-value bars and restaurants. If people watching is your favourite pastime, then Khao San Road is the place for you, with its throngs of dreadlocked, tie-dye wearing soap dodgers. As with lots of major cities worldwide Bangkok also has it's Chinatown. This area is always extremely busy and packed with market stalls. Although the Chinese community still continue their own traditions and religious practices they consider themselves to be 100% Thai. Chinatown has remained largely untouched by modern development and there are plenty of interesting sights. "Wat Traimit" with its 5 tonne solid gold Buddha image, the Dragon Lotus Temple (Wat Mangkon Kamalawat) and the Saphanthawong Museum to name but a few. It is also a great place to eat and experience some of the best Chinese restaurants outside mainland China. Most restaurants specialise in Cantonese cuisine and Dim Sum is also extremely popular. The nightlife options are extremely limited in Chinatown but for hotels there are plenty of good value mid-range properties. Chatuchak got its name from the large public park, that is located at heart of this district and it offers welcome respite from the hoardes of tourists!!! Today, Chatuchak is best known for playing host to the enormous weekend market. The size of the market is frightening and has to be seen to be believed. It covers an area of 35 acres has over 15,000 stalls and shops and welcomes over 200,000 people every Saturday and Sunday. If you are considering a trip to the market then the only advice I can offer is to arrive early, as you will beat the crowds and not have to struggle through the heat of the day!!!! The market runs from approxiately 8:00 am to 6pm every Saturday and Sunday. I hope this information will prove useful for anyone visiting Bangkok and as always I am keen to hear your comments and feedback. That was quite a review…. Thanks! I am planning a trip next month and being an avid photographer, my best bet for a Bangkok accommodation should be along the banks of the Chao Phraya river. Khao San Road has been my area of choice too, mainly because it’s lively, you get to meet new people and most cheap hotels in Bangkok are found here.